Hosco's new MIM-made paint restrictor. The company says that the MIM design has improved the ergonomics of the spray gun and has less pressure drop/shear and precise application flow rates when compared to standard stainless steel paint restrictors. In particular, a standard stainless steel paint restrictor’s weight can add to operator fatigue and some restrictors are not smooth bore and cavity free, which can result in pressure drops in the system as well as trapping paint in the cleaning process, ultimately resulting in dirty paint. 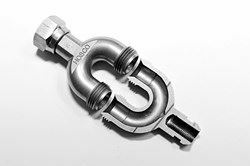 The 316 stainless steel Hosco HRU-6 has a 50% weight reduction over standard stainless steel restrictors and a smooth, curved interior radius which improves flow rates and minimises pressure loss and shear degradation of coatings, while maintaining peak transfer efficiency.